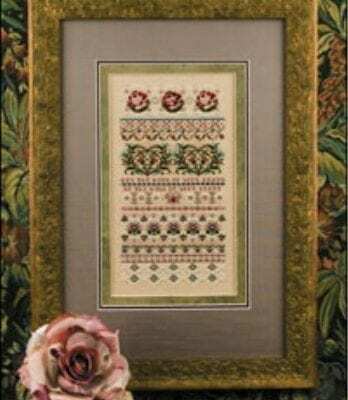 Designed by Nora Corbett this one is stitched on 32 count twilight Blue linen from Wichelt Imports. Stitch count is 196 x 186. 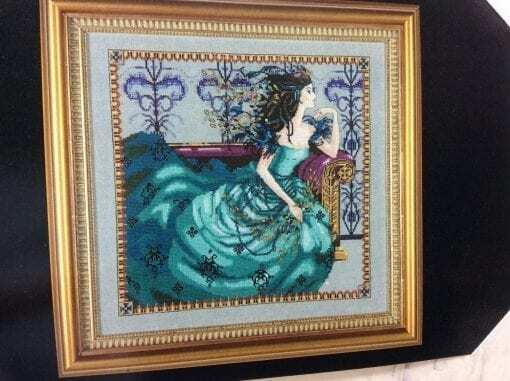 It can also be done on 16 ct Aida of the same color. It uses DMC floss, Caron Waterlilies silk floss, Kreinik 34 braids and Rainbow Gallery Wisper plus Mill Hill beads for accent. Once confined to a constellation in the heavens as a punishment for her vanity, Cassiopeia returns to earth holding delicate palm fronds, symbols of triumph and eternal life.